I had to do a double take when I stumbled upon these Unisa Gilles boots at DSW. 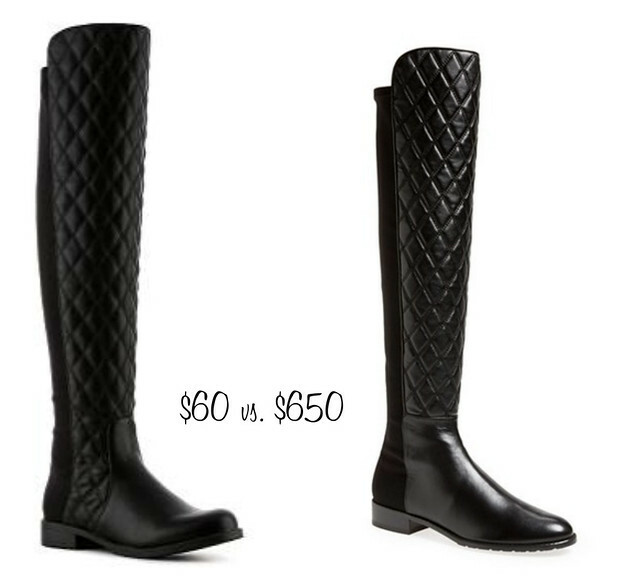 They’re almost a perfect dupe of the Stuart Weitzman quiltboot. See them on me here. Just like the ones I reviewed last week, these boots are a wonderful budget option. The fit on me is as expected. There is a little bunching in the ankle area but I have the same problem with the Stuart Weitzman as well. I prefer leather when it comes to footwear. However, I don’t dislike faux leather as long as it doesn't look like plastic. The material is quite nice for the price and the quilted pattern sure adds interest to the boots. I don’t expect them to look and feel luxurious as the designer version. You’re talking about a major difference in cost here. I still have a couple options that I’d like to try on in person but this pair is definitely high on my purchase list. Great review! I really love the OTK boot trend but can't justify an expensive purchase since I know I won't get to wear them that much in our warm climate. It's nice to know there are some affordable options out there. Oooh i do love the SW boots, but those are a great find! they look identical! Great review, and as for me me, I would so go for the $60 version, and only because my boots just doesn't get that much wear in them.